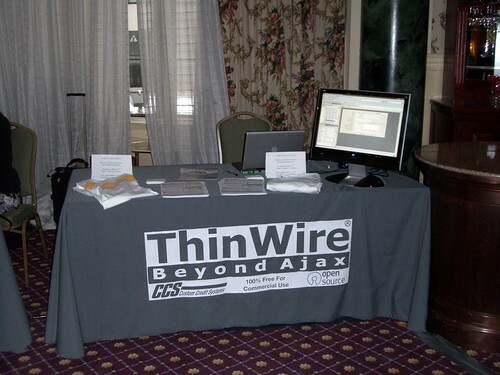 For those of you who have been following ThinWire, you have probably noticed that the framework has been receiving limited attention for a while now, and I want to take a few minutes to discuss why this is so that people are not left guessing. The other thing I want to touch on is what the frameworks future will likely be and to ask if there are developers who might be interested in joining the project to help establish the future of the framework. First, let me talk about the delays in development/releases. Part of the delay has been a result of backward compatibility testing that’s been going on by Custom Credit Systems (the company backing ThinWire) to make sure that the latest builds work correctly with the existing applications they have deployed with their customers. And since CCS’s customers are top U.S. banks, they tend to have a very rigorous testing process that spans months. However, I’m not going to try and convince you that’s the only reason for the delays in ThinWire development. The other, more important, reason is that both CCS and I have been discussing various options for ThinWire’s future over the last six months. It was just about six months ago that I decided to leave CCS to consider other options. I won’t bore with you some run-on about why I left; it’s suffice to say that CCS is a good company and I just wanted to try other things since I’d been working for them for over 7yrs. So, Java checked exceptions. Of all the Java hot-points, this one still has the power to invoke avid flame wars between those who feel they make the platform “enterprise” class and those who are so disgusted with writing try/catch blocks to wrap them that they are willing to defect to .Net & C# simply to escape the drudgery of it all (.Net does not have checked exceptions). Truthfully, as a developer that’s somewhat par for the course, you get used to paying for the mistakes of other developers and to be honest I know that when pressed for time I’ve written less than stellar code that I’m sure someone else has had to clean up. It’s just part of being a developer. However, the problem with checked exceptions is that when they are done wrong you suffer in really really ugly ways that take your suffering to completely new levels. In this article I’m going to first cover some of the various problems that exist with using checked exceptions and then… for the finale, I’m going to show you a technique I’ve started using in the ThinWire Ajax framework and other projects to force checked exceptions into behaving like plain old RuntimeExceptions. Yup, you read that correctly. If you just can’t wait to see how that’s possible, you can jump to the end. Although I am a technologist and I like pushing the limits of technology, I try to look at things from a users perspective as often as possible to make sure that I’m creating value and not just making decisions that would lead to things that I think are cool. End users, as most of us know, just want an application that works well and helps them do something they find important. The technology used to implement the application does not matter to them at all. You get bonus points for going above and beyond that bar with flashy effects and eye candy, but only if you’ve got your bases covered first. Development managers need to ask themselves at least these two questions before adopting Ajax on a project. First, will you make up for the time invested in adopting a new technology through increased development speed? 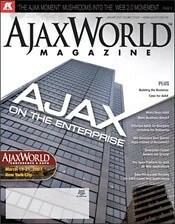 And second, will Ajax allow you to offer a more useful application to your users? Development managers are accustom to asking the first question about new technology because most organizations keep them focused on deadlines, budgets and getting functional requirements implemented quickly. However, really great organizations encourage their development managers to think about the user experience as well. Ok, well this is coming a bit late I realize, but we have been quite busy working on a surprise for the ThinWire community, so I haven’t had a good moment to sit down and tell everyone about our JavaOne experience. As for the surprise, details arriving soon… in another post. I just got back last night from New York and I thought I’d spend a few minutes letting everyone know how things went. The first day was a little taxing… I had to lug a 22″ flat panel screen, large suite case with conference goodies, and my laptop bag over a half mile from my hotel to the Roosevelt hotel that was hosting the event. As a side note, I have to say that New York was quite amazing. It was my first time there and I tried not to act to much like a tourist, but I couldn’t get over how enormous the place is and how the buildings are crammed right next to each other. Additionally, it was pretty cool to see the culture and people change from street to street… lots to see and do. On a related note, keep in mind that I’m going to be presenting at the AJAXWorld conference next month in New York City (March 19 – 21). 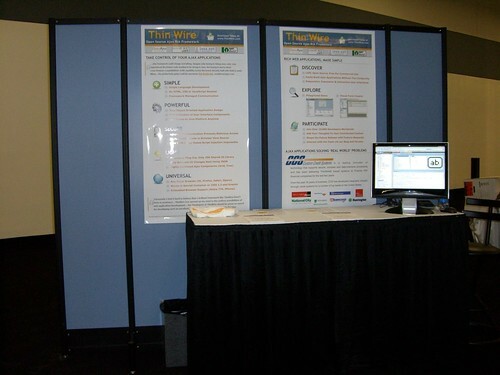 So if you can, sign up for the conference and come talk to members from the ThinWire team in person. The topic I’m going to be covering is centered around the article that was just published in February’s edition, but it will be much more hands on and interactive. Summary: What can I do to help? I have over 10 years of experience in the software & technology world, but ultimately, what matters to me is that I apply what I know to help others achieve their goals. I've spent time on both sides of the isle, both tackling complex technical issues, and dealing with the necessary realities of doing business in a timely and cost effective way. If there's someway I might be able to help you, please let me know. Interested In: great ideas, new ventures, business development, technology, writing, learning, software architecture, music, playing guitar & piano, camping, hiking, mountain climbing, and overall health.